After spending so much time in the States over winter, a tropical Mexican vacation was exactly what we needed! Neither of us had ever spent more than a day in Mexico before ((I stopped over on a cruise in high school… does that even count?!)) so we couldn’t wait to head down south to experience it together. We teamed up with Barceló Hotels and Resorts to spend a few days at their all-inclusive Riviera Maya property- Barceló Maya Grand Resort- and can’t wait to tell you guys all about it! Barceló Maya Grand Resort just may be the grandest hotel we’ve ever stayed at purely by scale— The sprawling property consists of 5 different hotels in one! The best part is that no matter which hotel you are actually staying in, you have access to 4 of these including each of their amenities, pools, and restaurants (and if you book your stay at the Palace Hotel you’ll have access to the full property). We stayed in Barceló Maya Caribe and our room was to die for with our own private pool and jacuzzi. We could have easily spent all of our time around this hotel, but we wanted to explore all of the property and couldn’t believe that there are 10 swimming pools, 22 restaurants, 3 theaters with live shows, and 2 night clubs. We get asked quite often which hotels we’ve been to are family friendly, and Barceló Maya most certainly is!! The property has tons of offerings for kids including family pools and water parks, activities for kids, and more. There is even a kid’s spa that was decked out in hot pink everything with manicure + pedicure stations. 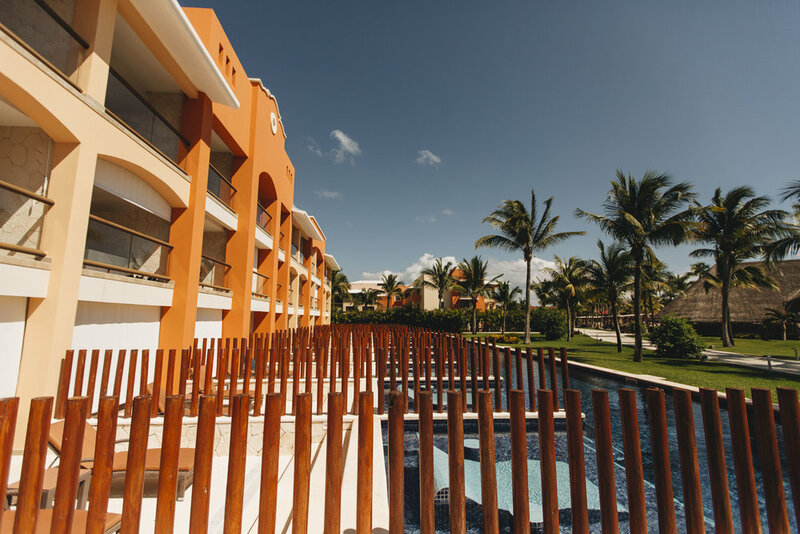 However, if you don’t have kids, Barceló Maya is still a great fit because there is an adult only pool, a fitness center and U-spa, and tons of space on the 2 km stretch of private beach to feel like you are on your own romantic getaway. There’s so much to say about this amazing property, but we’ll just leave you with our 6 favorite things about Barceló Maya Grand! Barceló Maya has it all. Food, beach, pools, restaurants, clubs, spa, waterparks, bars, and close proximity to Playa Del Carmen, Cancun and Tulum. It’s a perfect option for North American’s needing an escape from the cold, and whether you’re looking for romance, party or family fun- this resort is a must-see! I hope you enjoyed this recap of our stay in Cancun at the lovely Barceló Maya Grand Resort! As always, let us know if you have any questions about this property or the area! In the meantime, Click here to check out more about the resort and to book your stay! *The post was sponsored by Barceló Maya Grand, but our opinions, as always, are our own!